While we’re awaiting the Fed’s decision on interest rates at the time of writing this article we thought we’d delve into year-end inventory numbers in SW Florida. Could this be a perfect storm for Southwest Florida home sellers? We’ve been saying for quite awhile this may be the perfect time to sell your home as rates are low and inventory is low. Buyers have to compete against each other to win bids. In a normal market it feels like the buyer is competing against the seller and that’s just not the case right now. As rates rise it will begin, albeit slowly, to price buyers out of certain price ranges. Ultimately this will begin the process of adding inventory to the market as there will be less buyers competing for each listing. It may force buyers down in price range and increase the number of buyers at the low end of the spectrum, but then again some buyers at the low end will be priced out completely, so that may wash.
We never know how many buyers become priced out. All we do know is that a 1% increase in rates equates to about 11% less purchasing power for any given borrower. 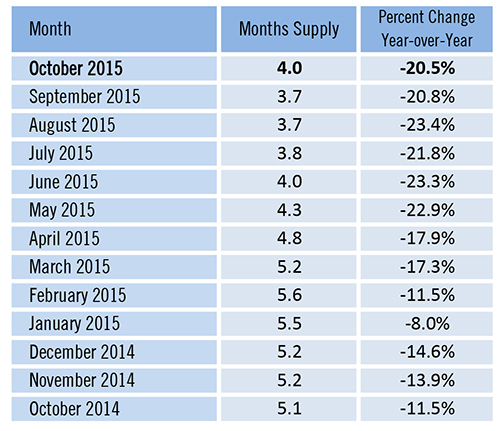 Month’s supply of inventory is also down 20.5% from last year. Currently it sits at 4.0 months, which is up from September’s 3.7 months. Last year supply was running around 5 months. If you’re a seller, it’s really a “Perfect Storm” to sell right now. Listing inventory is down right now, and nobody knows how long it will be this low. The one thing we know for sure is that real estate is never constant. External forces influence inventory levels, demand, and ultimately pricing. Rising rates is a big driver which influences demand. It affects affordability. It also affects consumer confidence. While higher rates slightly above zero percent shouldn’t affect buyers too much right now, the psychology of continued rising rates can influence consumer sentiment going forward. Nobody is really concerned about the first Fed rate increase. It’s just that when they start raising rates, they usually continue. Nobody wants to see rates stay at zero percent forever, and yet everyone is afraid to begin the process. They cannot stay where they are, although empirical evidence suggests if you had a basis to place rates at zero for several years, there is still some evidence that suggests rates should stay there. And if you believe rates need to stay at zero then you’ll be against beginning the process now. If I had a dollar for every time a seller said they should have sold back in time I’d be a rich man. Let me be clear, we think we’re going to have a good market in 2016. Prices may rise. We’re not saying we have a Top to the market. All we are saying is it’s a lot more fun to sell when you have little to no competition from other sellers. You place all the competition onto buyers to compete. These days won’t last forever. You’ll still be able to sell when you’re competing against other sellers. It’s just won’t be as much fun. Imagine if you played poker and you were dealt the hand of your life. You’d probably bet that hand differently than a normal hand. And you surely wouldn’t fold. If you’re thinking of selling, play that winning hand while you got it. Posted in Cape Coral, Cape Coral Real Estate, Fort Myers, Fort Myers Beach, Fort Myers Real Estate, Southwest Florida Real Estate.Tagged A Perfect Storm for Southwest Florida Home Sellers.